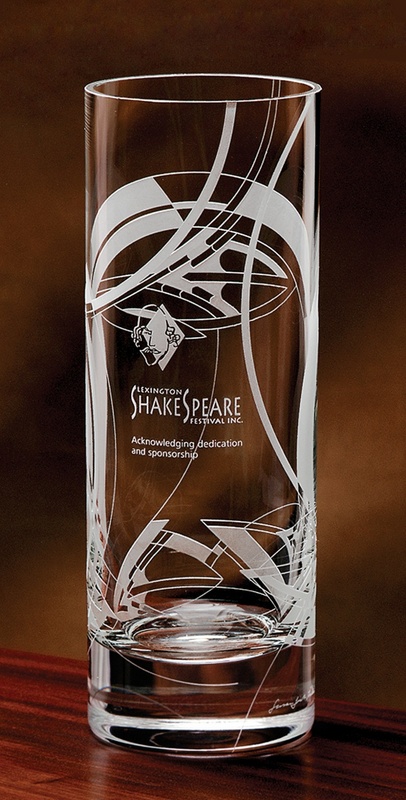 In the Spirit of Frank Lloyd Wright� Swirling patterns etched upon glass cylindricals create endless shapes of beauty. With this design the artist presents us with images of the sea. Her fluid and overlapping curvilinears move as we move; its energy reminiscent of vast oceans while inspiring us with its sense of mystery. Like the infinite sea, this work of art speaks of life's unlimited possibilities and the untapped potential that lives within. Unmistakably connected to nature, these mouth-blown pieces promise to feed the soul like a walk on the beach. Each award is signed by the artist, Susan Jacobs Lockhart, and a $10 contribution will be made to the Frank Lloyd Wright School of Architecture on behalf of your purchase. 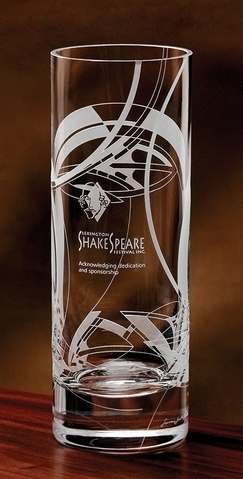 A romance booklet about this award and your donation is included for your presentation.